Discussion in 'Classic Manual Cameras' started by lesged, Apr 28, 2005. This conundrum was lost in another thread. Please tell me what this lens is besides being cannibalized. Note in the two photos that the fstops have different numerical sequences: On the face it reads "Leitz Elmar 1:3,5 F=50mm with fstops: 3,5 4,5 6,3 9 12,5 18" On the base the fstops are | 4 5,6 8 11 16 Which part of the lens is correct? Is it just a fake front plate? And if so, is it at least a faithful copy of a real Elmar? Or is there some noticable counterfeiting error or omission? Could I have a legit Elmar and a cannibalized base plate? They obviously don't match and I don't see any serial number. Where would it be, if it were the genuine article? Have any of you seen this combination before? Has anyone put one together like this, because of a missing or damaged part? Thanks in advance for any help in determining what this is. The photos it takes are quite decent. I'll post a scan tomorrow. I am almost sure that this is a fake, and even from a Zorki lens, not from a FED lens. FED lenses usually have an aperture setting tab, not a knurled ring. The Elmars also had a tab. I think the difference between the DOF and the aperture scale is a result of faking - it is easier to make engravings on a face plate (or glue a new engraved layer on the face plate) than to re-engrave the DOF scale. Probably the Zorki lenses had a 'modern' DOF and aperture scale (5.6-8-11 etc) but the faker wanted to fake a pre-war lens with different f-stops (6.3-9-12 etc.). Kelly--- I'm not familiar with the difference between an I-22 and an I-50; could you please educate me? Winfried---Your explanation makes lots of sense and just for the reasons you stated. I was curious how good a fake is the engraving on the front face. Your comment of tab vs knurled boss is one clue that nails it as not being a bona fide Elmar. Please see OT comment below. Mike-- Thanks for reassurance. I get it. A rose is a rose, is a rose, but sometimes it's a Tessar, or Elmar, or Industar--but they all smell just as sweet. OT-- Winfried, your narrowing down of details forming a conclusion is in the style of Sherlock Holmes, known for his skill using deduction (or is it induction?) fits the bill. I tried to elicit this spirit of investigation in my earlier thread when I asked if there were any photo detective out there. There were no takers. Frankly, I was surprised. I thought all the amateur photo gum shoes would nibble at the bait. It didn't happen, wrong bait! I should know this well as it's trout season. The lesson I learned is: keep threads on one topic; don't split the theme of a thread, and most of all choose better titles: ones which draw in the people who are apt to have an interest and/or knowledge in the subject of the thread. I'll try to reform. Indeed, the Elmar is a Tessar copy, a good copy, but a copy. Um, er, ah, if the Vade Mecum is to be believed on this subject the Elmar isn't quite a Tessar copy. In the same design family, yes, but not exactly the same. Big difference in curvatures leading to a difference in placement of the diaphragm. Between the singlets in the Elmar, between the second singlet and the cemented pair in the Tessar. Miles, spoken like a true Zeiss man. Dan is correct and I do recall this difference, though (at least IMO) 4/3 design is a Tessar, wherever the diaphragm is located. The change may derive somehow from the differences moving from leaf shutter lenses to one of the world's premier focal plane shutter cameras. Um, Mike, it went both ways. I have a 90/6.3 CZJ "M." Charlie, Marc, and I complied a list of all of our CZJ macro lenses. From it, it appears that the marking "M" replaced "Mikrotar" after the Oberkochen-Jena lawsuit was settled. My 90/6.3 is a reversed Elmar, with cemented doublet facing the subject and the diaphragm between the two singlets. Most, if not all, of the other sizes of Mikrotar are triplets. Looking at my "secret stash", I found one FED, two Industar-50's and one Industar-22 lenses with the same "3.5, 4, 5.6, 8, 11, 16" stops. The FED lens has a tab, the Industars do not. The aperture adjustment and knurlig at the front of the lens is not of Leica design. Definitely a fake! Its a Zorki lens, the apeture adjustment ring gives that away, also if it were a real Elmar the apeture blades would be right behind the front element and not buried behind more glass down the barrel. Actually the first (prototype) Elmars started as a five-element design (with 3 cemented rear elements). It was changed prior to mass production to a four-element design with 2 cemented rear elements due to the availability of new optical glasses from Schott. 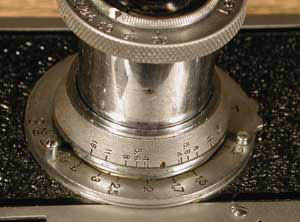 Zeiss had its Tessar design patented around the same time and Leitz did not want to argue against this patent, since Schott was a member of the Zeiss syndicate. Also, they found that their own 4-element design was protected by the Zeiss patent claims, too, so noone was allowed to manufacture Elmar copies. There is somewhat more to the position of the aperture. The aperture always has to be in the lens' nodal point in order not to cause vignetting. It is a major difference whether the nodal point is just behind the front lens element, or behind the second element (I know that all lenses have two nodal points but on more or less symmetrical designs both are very close to each other). I think that the early FED lenses actually were Elmar copies. The Zorki lenses rather seem to be Tessar copies, hence the more recessed position of the aperture. Winfried, Rudolph's US patent on the Tessar, number 721, 240, was issued February 23, 1903. I believe that the British and German patents were issued at about the same time. Tell us, please when the Elmar was designed. I think you are confused about what affects where the diaphragm should go. Would you please give a reference? It is correct that the Tessar patent was issued long before the Elmar design. I have to re-read this issue which was just tackled in a german collectors' magazine. But I remember quite well that Leitz and Zeiss made an agreement concerning 'violation' of the Tessar patent by Leitz. However, I will gratefully receive any information on aperture placement inside a lens. I have some books on applied optics I will consult later concerning this issue. The Elmar came out about when the Tessar patent expired; or a few moons later. 'The Leica was brought to market in 1925 with an Elmax lens. This lens had a double-cemented rear lens group (i.e. a rear element cemented from three lens elements WB). Soon Prof. Berek managed to equip the Leica with the new Elmax lens in May 1925, improving image quality and using a single-cemented (i.e. cemented from two elements) rear lens group. 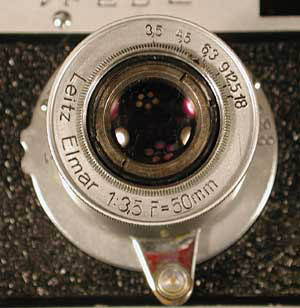 Leitz missed to protect the design of this lens prior to releasing it. On June 26, 1926 Carl Zeiss applied for a patent for a lens (nr. 463739), which was acknowledged by us (Leitz) as being equivalent to the Elmar design on April 5, 1928. In November 1928 a lot of advertising was released for the Tessar: 'A completely new design... Tessar f/3.5, a lens equivalent to the first-class f/4.5 lens but capturing 65 p.c. more light.' After that there was a lot of quite cunning communication between Carl Zeiss and Ernst Leitz which finally resulted in the Zeiss company acknowledging the Leitz Elmar lens designed in 1925 as fulfilling the claims of the new (Tessar WB) f/3.5 lens. Since after granting the patent to Zeiss copying by other manufacturers was prohibited, Leitz believed to be protected against competition and did not file a lawsuit against the Tessar-Patent' (printed in german in 'photo-deal' April 2005 issue). Concerning the arrangement of an aperture in a lens, it is correct that it does not have necessarily to be in the place of the nodal point(s). In a composite lens (i.e. a lens with several elements) it may be arranged such that it is projected by the front or rear lens element as an entry or exit pupil, at least that's what the textbook of my lecturer in applied optics say. Thank you for the clarification, Winfried. Post in haste, clarify at leisure. The front ring on a Zorki Industar is usually a little deeper than the Fed or Industar-10 (Fed Industar) My best guess is that it is an I-22 or I-50. Isn't it true that Leitz lenses were marked 5cm rather than 50mm? I know the Soviet lenses were marked in mm.